Building on the success of several recent special-edition Jeep vehicles, the Jeep® brand announced the new 2012 Jeep Wrangler Arctic. Jeep Wrangler Arctic offers an aggressive Wrangler Rubicon tire and wheel package, with unique semi-gloss black 17-inch wheels shod with 32-inch tires. Inside, Wrangler Arctic’s seats are black Tectonic fabric with Polar White accents and orange accent stitching. Front seats are heated and feature an “Arctic” logo in the seat back. Accent stitching can also be found on the steering wheel, arm rest and console lid. Door trim and nets are accented in orange, and all grab handles and dashboard vent rings are finished in Polar White trim. 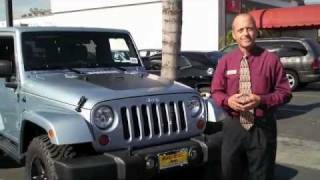 November 9, 2011 , Auburn Hills, Mich. - Building on the success of several recent special-edition Jeep vehicles, the Jeep® brand is introducing its latest models: the new 2012 Jeep Wrangler Arctic and Jeep Liberty Arctic. Based on the Wrangler Sahara model, the Arctic’s winter theme is immediately recognizable. Available colors are Winter Chill, Bright Silver and Bright White. Exterior features include a body-color hardtop and fender flares, “Arctic” badges on the front fenders, a “Yeti Footprint” decal over part of the driver’s side fender and hood, black hood decal and Mopar® black fuel filler door and taillamp guards. Jeep Wrangler Arctic also offers an aggressive Wrangler Rubicon tire and wheel package, with unique semi-gloss black 17-inch wheels shod with 32-inch tires. Inside, Wrangler Arctic’s seats are black Tectonic fabric with Polar White accents and orange accent stitching. Front seats are heated and feature an “Arctic” logo in the seat back. Accent stitching can also be found on the steering wheel, arm rest and console lid. Door trim and nets are accented in orange, and all grab handles and dashboard vent rings are finished in Polar White trim. Mopar tread pattern slush mats with white “Jeep” lettering complete the Wrangler Arctic package. Jeep® Wrangler – the most capable and recognized vehicle in the world – becomes even more capable both on- and off-road for 2012, courtesy of an all-new, more fuel efficient and more powerful 3.6-liter V-6 engine, and a new five-speed automatic transmission – both of which it shares with the award-winning Jeep Grand Cherokee. Chrysler Group’s 3.6-liter Pentastar V-6 engine – winner of the prestigious Ward’s 10 Best Engines award – delivers 285 horsepower (209 kW) and 260 (353 N•m) lb.-ft. of torque, while delivering up to 21 miles per gallon highway in the 2012 Jeep Wrangler. The improvement, when compared to the previous 3.8-liter V-6 engine, is 40 percent in horsepower and 10 percent in torque. 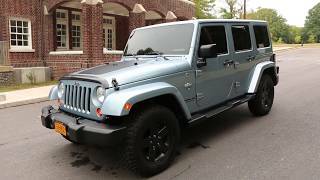 Additionally, for refined shifting and greater performance, the Jeep Wrangler migrates from a four-speed to a new five-speed automatic transmission. 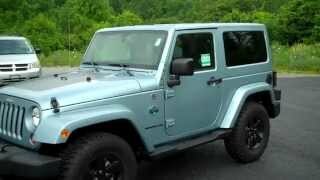 The 2012 Jeep Wrangler also features the company’s first application of a manual transmission to the Pentastar V-6. Jeep continues to refine the successful Wrangler formula by combining legendary, benchmark capability with an interior that delivers rich styling with significantly upgraded touch surfaces, occupant comfort and versatility, and a premium appearance courtesy of a body-color hardtop for the popular Sahara and Rubicon models. 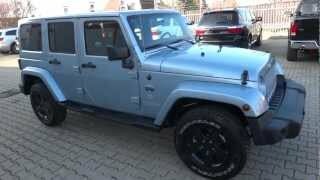 2012 Jeep Wrangler ArcticBased on the Wrangler Sahara model, the Arctic’s winter theme is immediately recognizable. Available colors are Winter Chill, Bright Silver and Bright White. Exterior features include a body-color hardtop and fender flares, “Arctic” badges on the front fenders, a “Yeti Footprint” decal over part of the driver’s side fender and hood, black hood decal and Mopar® black fuel filler door and taillamp guards. 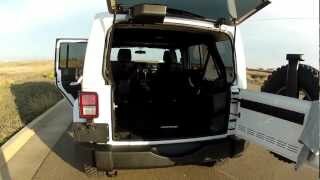 2012 Jeep Liberty ArcticAvailable on Liberty Sport 4x4 models, the Arctic shares many of the same features as the Wrangler Arctic. Available exterior colors are Winter Chill, Bright Silver, Bright White and Mineral Gray. “Arctic” badges on the front fenders are shared, though the “Arctic” decal on the hood is unique to Liberty. Semi-gloss black 16-inch aluminum wheels with center caps painted semi-gloss black are wrapped in P235/70R16 OWL all-terrain tires. Rounding out the exterior highlights are deep tint glass and tow hooks, blacked-out headlamps and standard fog lamps. 2012 Jeep WranglerJeep® Wrangler – the most capable and recognized vehicle in the world – becomes even more capable both on- and off-road for 2012, courtesy of an all-new, more fuel efficient and more powerful 3.6-liter V-6 engine, and a new five-speed automatic transmission – both of which it shares with the award-winning Jeep Grand Cherokee. 2012 Jeep LibertyJeep Liberty remains true to Jeep’s legendary 4x4 heritage by offering two Jeep Trail Rated® four-wheel-drive systems – Command-Trac II® and Selec-Trac II®. Command-Trac II® is a part-time four-wheel-drive system, which is the standard 4WD configuration. Command-Trac II operates in 2WD, 4WD Lock, 4 WD Low and Neutral. Jeep BrandBuilt on 70 years of legendary heritage, Jeep is the authentic SUV with class-leading capability, craftsmanship and versatility for people who seek extraordinary journeys. The Jeep brand delivers an open invitation to live life to the fullest by offering a full line of vehicles that continue to provide owners with a sense of security to handle any journey with confidence.